I always lit my room with string lights at home, but I did not realize how much that was going to translate into creating “my home away from home” when I got to college. String lights create a soft ambience anywhere they are hung up. They create a mood that is comforting and relaxing. They completely eliminate the need to use the treacherous overhead lighting in the dorms. String lights help make a sterile space in the dorms feel like your home. I found that when I would visit friends’ dorms that did not have good lighting, I was always on edge and anxious. The LED lighting was not home-y in the slightest; it made for a much less comfortable relaxation time. 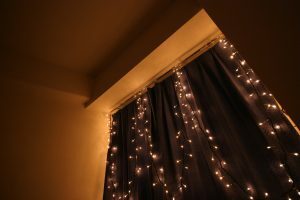 But with one simple and cheap alternative, string lights can add so much to a room. You do not really notice they are there until they are not; when you are sitting in a fluorescently lit room, squinting trying to talk to your friend. String lights bring a sense of home to a space that can be really hard to transition into for new freshman in the dorms.